I had off for three days last week for spring break (perks of working at a university), so I had some glorious thrifting time! I spent a few long hours on Monday at one thrift store, and came home with a bunch of great items. Then, on Tuesday I spent about an hour at a second thrift store and scored big on shoes! While my favorite thrift store has special sale days where certain colors of tags are on sale, the majority of the time I don’t end up with anything that special sale color. However, when I went on Monday, all blue and pink tags were 33% off AND all violet and yellow tags were 50% off! I typically don’t thrift items to sell, but occasionally I’ll pick up an Anthropologie item because they tend to sell pretty quickly. 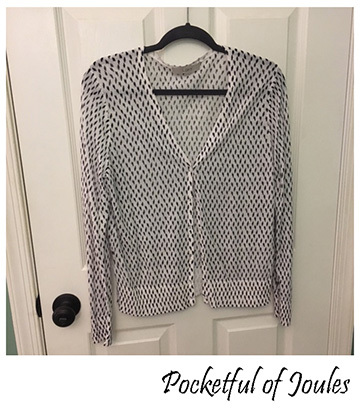 This Cartonnier blazer is great and I actually own it in a size large. 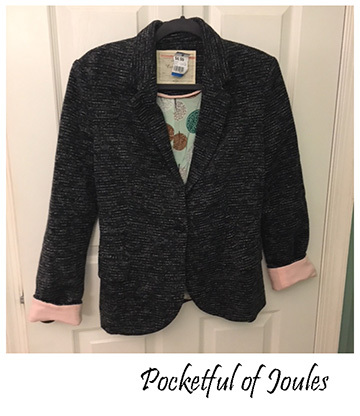 I decided to buy this for $4.69 because I love mine and identical blazers are currently selling on Poshmark for around $40. 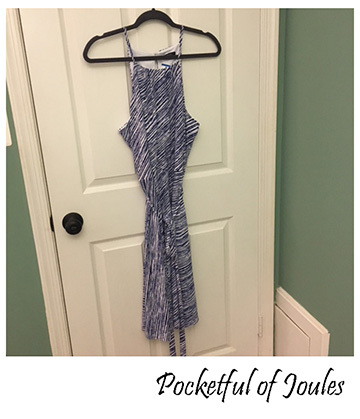 I love Moulinette Soeurs dresses and would totally keep this one for myself if I were a few inches shorter. As it is, the medium on me is a bit too short on my 5’7” height. The dress is gorgeous though and in perfect condition. It retailed for $228 and is currently listed on Poshmark for $130 – $150. I’m going to list it soon and add any earnings to my vacation funds account! 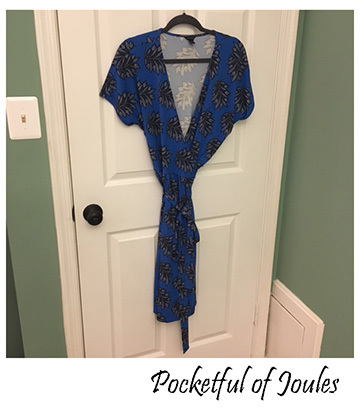 I really like this pretty blue ‘boyfriend’ sweater and the linen weave is perfect for spring. This one was a steal for less than $6 and I’ll certainly get my money’s worth out of it! 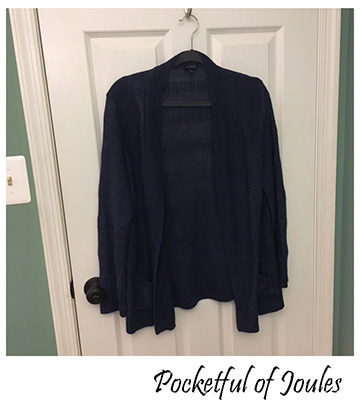 I loved this lightweight dotted cardigan when I picked it up, but then once I realized it was half-off with a yellow tag, I loved it even more. I like the dots a lot and it looks great with as simple t-shirt and jeans. I actually already wore this one once and will be wearing it again and again this spring! Once again, a lesson in trying on everything you like no matter what the size tag says! This dress was marked a size 16, but fits like a size 10/12. 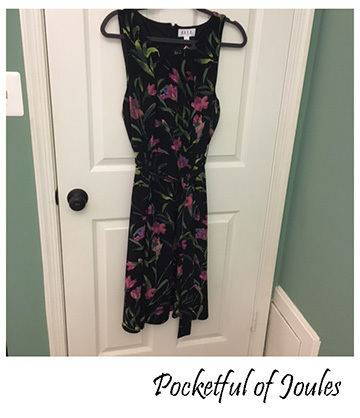 I like the darker floral pattern along with the tucked neckline and tie-waist. This will look great with a pretty cardigan and flats for work. 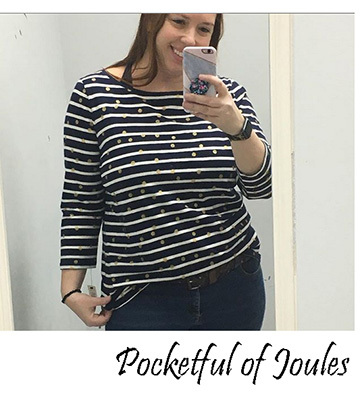 I love the mixture of dots and stripes on this soft cotton top. It must have been designed to be worn more fitted, but I like that by sizing up it’s a little roomy for a slouchy fit. I’ll certainly be pairing this with jeans and maybe even some shorts in the summer. I wore it for a hot-minute this morning, before I found out my meeting was cancelled (so I changed back into sweatpants). I picked up this dress and immediately liked the fabric colors. I was cautiously optimistic though because it doesn’t have a size tag and the thrift store had marked it an 8. I tried it on anyways and it fit great! 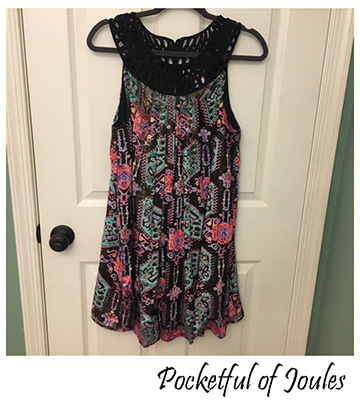 This will be perfect for work with a cute cardigan or on vacation down at the beach with sandals. Such a steal for $10! I typically don’t bother sorting through the exercise legging section because it tends to be a lot of crap. However, these were hanging by the end of the aisle so I grabbed them up to try. Lucy is a great brand that was recently purchased by The North Face. These leggings are made of extra thick but stretchy fabric, so I’m happy to have gotten them for just $5. I freely admit that this purchase was an oops purchase. I liked them when I tried them on in the fitting room, but once I got them home and washed them, they are no longer winners in my book. Luckily this was just a $5.36 mistake. I’ll add them back in to my re-donate pile for another thrifter to enjoy. I saw this tote from across the aisle and it was LOVE at first sight. It’s brand new with tags still on, in perfect condition and a great size for hauling a bunch of crap around. I did a quick search and found that the retail value for this bag was $100, which seems crazy high. 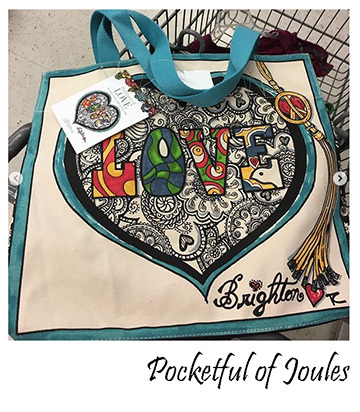 However, once my friend suggested it might have been a gift with purchase, I honed in on an old Brighton Facebook post from June 2017 announcing the limited edition bag as a gift with purchase for anyone who spent over $100 on jewelry. Any which way, I love it! 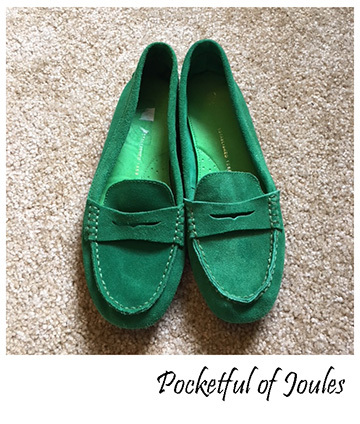 I love the bright green colored suede of these fun Gap driving moccasins/loafers. 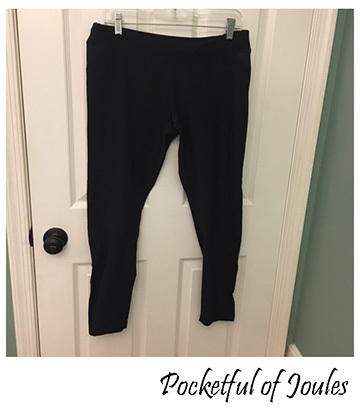 These are a little preppy for my typical outfits, even though the pop of color is fantastic. I’m thinking I may use these as my summer slippers for around the house. 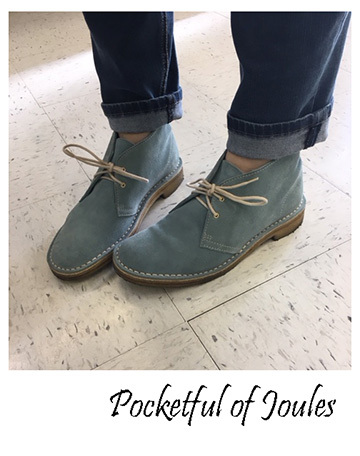 Another total shoe score… these fantastic blue suede Kate Spade chukka boots! I love, love, love this find and apparently they retailed for somewhere between $250 – 300. 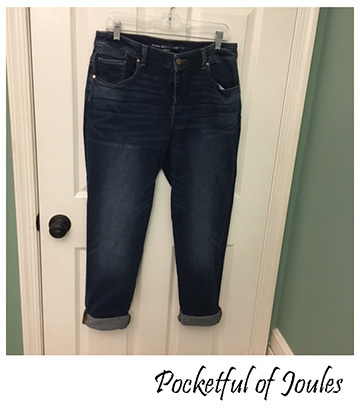 They are my size, super comfortable and will look great with some rolled up boyfriend jeans this spring! Did you have any luck thrifting this month? Share your scores! I had too many finds LOL. There’s a Goodwill right by my physical therapist office, so I have been stopping in weekly. 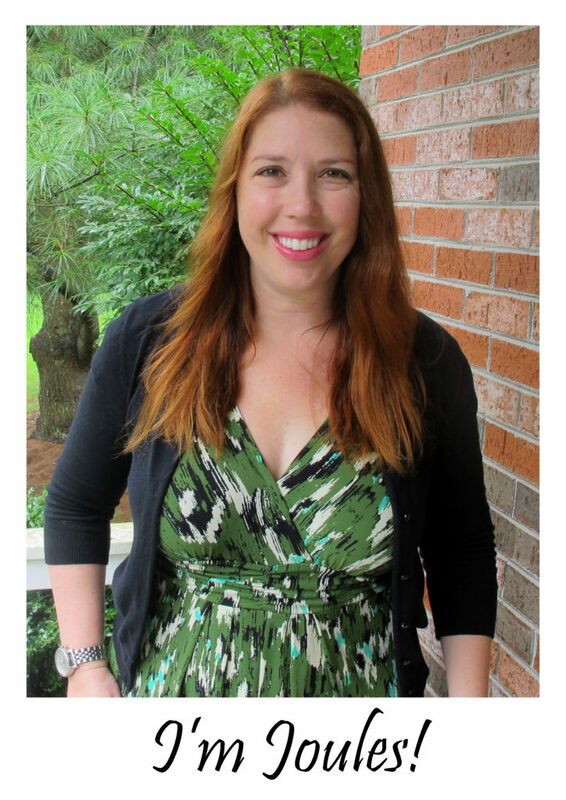 I am obsessed with that Anthropologie dress. But I need it in an XL lol.